It has been a while since I did my last statistics post, so I want to report that we finally got some rain. It’s not as strong here, in the Bay Area, as it is in Southern California and it still hasn’t put an end to the 5-year drought but it definitely helped. It’s interesting how circumstances might change someone’s perspective: even 10 years ago I would have never thought that I would ever feel genuinely happy because of the consecutive rainy days. 2015 was one of the busiest years in my adult life. And in addition to that I was fighting persistent cough for about three months. It proved to be an allergy not related to my perfume usage but for a while I wasn’t sure. As the result both my perfumes testing and wearing went down significantly. Since I wasn’t actively seeking new releases, I’ve got to try meager 28 perfumes released in 2015. As I was reading “Best of 2015” on different blogs, I kept shaking my head: no, nope, didn’t try this one either… It doesn’t upset me much: I have a great collection of perfumes that I enjoy wearing and last year I managed to test 64 more new (for me) perfumes, which makes it 92 new perfumes tested – not that bad. And I was doing some re-testing of previously tested perfumes. That brings me to 178 perfumes from 85 brands tested on 227 occasions. 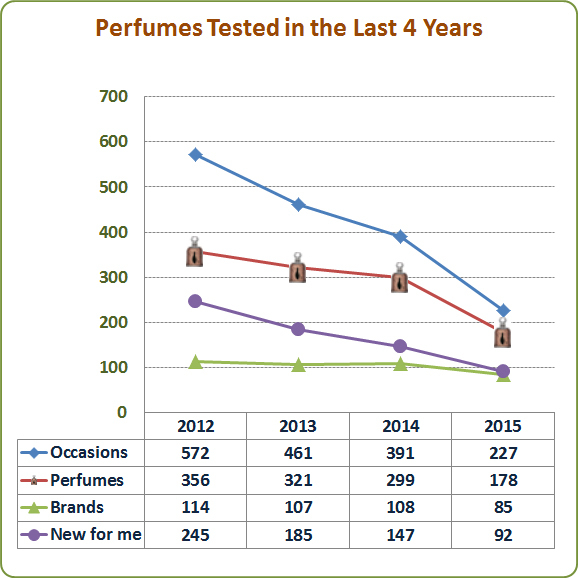 The numbers are the lowest out of the last four years during which I track perfumes testing separately from the perfume wearing. I wonder if this downhill trend continues this year or have I reached a plateau? Before I looked closer at the perfumes I tested for the first time I had a feeling that I disliked most of the perfumes I tried. It’s not so in reality: I liked more perfumes that I disliked (29 vs. 23), but mostly I felt indifferent (40). Either I’m getting pickier or perfumes are getting worse or it’s some strange statistical anomaly and I managed to get mostly boring perfumes to try last year. Even among those 29 perfumes that I liked only one became a bottle in my collection (Jo Malone Mimosa & Cardamom), one more will probably end up there as well this year (Puredistance WHITE) and I think of re-testing six or seven to see if I actually would want to wear any of them (Atelier Cologne Jasmin Angélique, Frapin 1270, Giorgio Armani Myrrhe Impériale, NVC Pichola, Ormonde Jayne Vanille d’Iris, L’Artisan Parfumeur Noir Exquis and, maybe, Dame Perfumery Black Flower Mexican Vanilla). So I wonder if I have simply tried too little this year for the odds of an epiphany to be stacked in my favour, or whether I am too hardboiled, or have just reached a more mellow phase in my hobby where nothing is going to get my heart racing. I am racking my brains to remember if I have ever felt completely transported by a scent – you know, a feeling of being utterly blown away. I’d like to think so, but as I sit here I can’t connect with any such feelings from the past. Even my all-time favourite scents don’t move me now to that degree. When I wear my all-time favorites almost every time I feel amazed how much I like them. In 2015 I wore 156 perfumes from 56 brands on 304 occasions. 2015 was the first year (out of four), in which not a single new brand made it to my Top 10 Brands list. The first seven brands from 2015 appeared in each of the previous three years’ round-ups as well. Number eight made Top 10 in 2012 & 2013. Number nine and ten appeared once in 2013 and 2014’s lists correspondingly. As to the perfumes that got the most skin time in 2015, there weren’t any surprises other than, maybe, Bois des Iles – but only because it’s the only perfume on the list that I used from the decant. Maybe it’s a sign? Do you have any perfume-related New Year resolutions? This entry was posted in "Four legs good", Favorite Perfumes, My Stats. Bookmark the permalink. Happy New Year my dear and what a great start into 2016 with some yearly statistics. I’m still pretty amused at how you manage to keep track of everything, not only perfume you wear but also the occasions. Well done. I have tested for sure more of the new releases than you but I tested less than I did in 2014, mostly due to my physical condition during a super hot summer we had. Like you, I don’t think there was a scent that absolutely has blown my mind in 2015. There were a few I loved, but they were not that mind-blowing. I record in the database all the perfumes that I either wear or test, including date, occasion (e.g. office wear, formal party, vacation day, etc. ), my reaction to it (formalized) and a free text note. So it’s not that hard to run the calculations when I want to. I didn’t try that many new perfumes either. I’ve got some catching up to do. This year I plan to buy less and enjoy what I have more. Nothing has really blown me away lately so hopefully I can stick to that plan. Since I started wearing only my favorite perfumes (vs. perfumes I test), I’m enjoying my collection much more. As to buying perfumes… I think for a long time before buying a bottle (sometimes a year or two), but then if I come across a good price I might to go for several bottles from my mental “to buy” list in a very short period of time. And then again I have no space (but at least I do not complain that “I have absolutely nothing to wear” :) ). I think it’s wonderful that you still get amazed how much you love your favourite perfumes when you wear them. I’ve never felt an almost overwhelming rush of emotion on trying a perfume but I still get joy from my faves. I’m sure Vanessa will agree with me that your testing rate is still pretty impressive compared to some of us. I think we do get pickier and less excited about the new perfumes we try the further down th road we get. It’s bound to happen, I guess. I still find testing new stuff interesting though, even if I don’t love it and want to own it (probably a good turn of events really). I enjoy testing new stuff and would never refuse to try something new. But I refuse to spend money on testing: I have more than enough perfume to wear for the next many years. So either I can get samples in a swap, as a part of a purchase or free at a store – or I do not test it. You are so well organised, Undina. I have no idea how many new releases I tried in 2015… which brings the subject of New Year’s resolutions. I’m determined to get organised this year, specifically with perfume samples. I’m pretty methodical so I’m hoping that I can keep this resolution for change. I can’t say that I’m very organized but I’m trying to be better. And I like numbers. I need to come up with some new aspects for “counting” my hobby to keep these stats entertaining. Hello Undina, I am a frequent reader, but infrequent commenter, who wishes you a happy new year. Thank you for your scented musings. 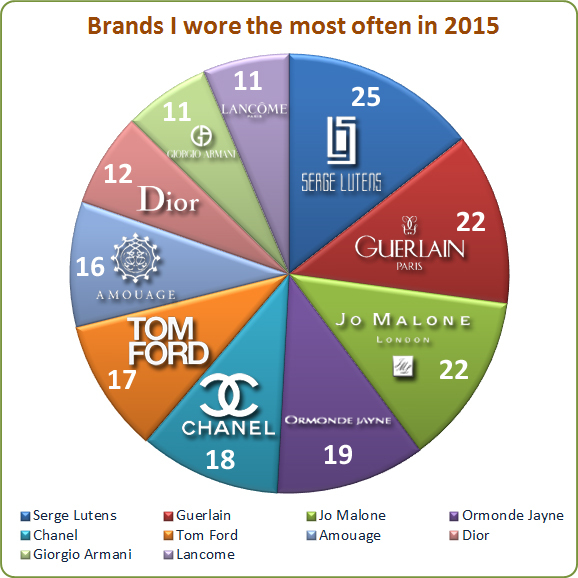 I am happy to see Guerlain and Jo Malone taking 2nd and 3rd place in your Brands pie chart. I enjoy several scents from those houses. Your number 1 inspires me to better explore Serge Lutens fragrances this year after having tried only one that I can think of, Un Bois Vanille. Onward and upward! Hi Tiffanie! Thank you for the wishes – and Happy New Year to you too! I’m glad to see you here and hope there will be more topics that would prompt you to de-lurk. Jo Malone has always been one of my favorite brands, while both SL and Guerlain grew on me over years. 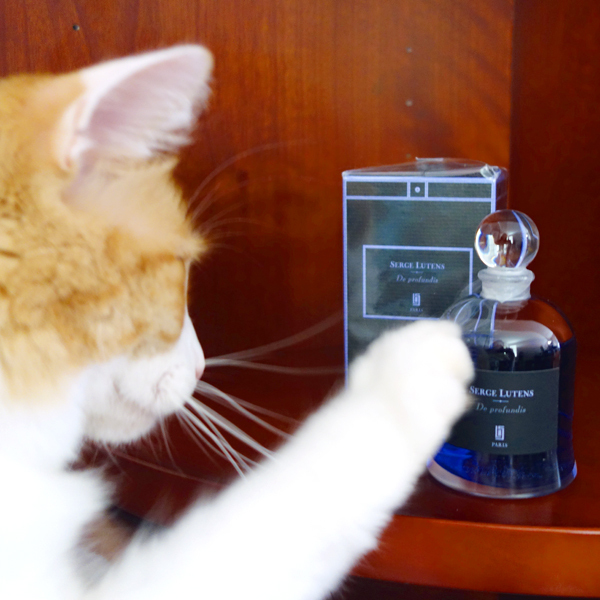 I’m sure that if you get to try enough of Lutens’ perfumes, you’ll find at least a couple of favorites. So many interesting aspects to this round up post! As Tara mentions, I do think your rate of testing remains impressive, and I am also heartened to learn that your success rate is similar to mine, or what I imagine mine might be if I was organised enough to record it…;) I have probably tried more perfumes than I think this year, but oddly enough, few major releases – more things people have slipped my way in swaps etc from any year. And some may have come out in 2015 but I am simply not keeping track of what is new new vs new to me. Oh, thanks for the link to those comments of mine on Bonkers. I was just segue-ing into a migraine when I wrote that post, so I may have been feeling unduly downbeat at the time, but I do think I am less excited by perfume than I used to be. I do still love my favourites, but in a more companionable way rather than the ecstasy of the honeymoon period! Vanessa, I hope you’re feeling better. Every time I read in your posts something that resonates with my thoughts I feel pleased. So in this case – for both the part where we matched and where we differed – I just had to share with others. Thank you, Steve (from Rusty as well but I substituted a kiss with a couple of treats – he clearly prefers those). Five years ago I started with testing perfumes every day, sometimes multiple times per day. Then I realized that I almost stopped wearing perfumes I liked in order to test new and new perfumes. Then I made a rule to wear one of my favorites at least three times per week. Nowadays I wear my perfumes six time per week and test either in the evening or on weekends. Interested to hear that you still love your favorites, because that is my feeling too. I still get a little shock from Alpona (Wow! ), Tabac Blond ( Oh Wow! ), and a sort of slow burn from Guerlains (This gets seriously good!). Some just feel like perfect clothes do, always right never wrinkle or make you look fat (Cigalia) others simply make me smile ( Vanille Tonka, Balkis) and others take me back instantly somewhere I may or may not like to go (Lys Mediterranee), but it’s fair to say I get a kick out of them and I’m glad to hear you do too-also glad that your cough cleared up. It pleases me too that my favorites are still my favorites. Maybe partially it happens because I wear my “best” perfumes only for special occasions so I don’t get used to them. Hi Undina! I always enjoy your statistics posts! Your recordkeeping and of course, your taste in perfumes, are impeccable. I did not make any resolutions at all in any part of my life so there will be nothing broken in 2016 :-). That said, I am culling my perfume stash to participate in Smell Good, Do Good 2.0 (http://thescentsofself.com/2016/01/05/smell-good-do-good-2-0/). So…per the picture with the inimitable Rusty, is De Profundis an albatross? I’m thinking not but just have to ask! I’m glad your cough cleared up! Thank you, hajusuuri! As I said, that resolution was the only one and even then it was made just because I have no idea what to do with the latest Christmas/NY gifts :) There’s no way they’ll fit on my two shelves. De Profundis is definitely NOT an albatross, but that picture was a good illustration on how I might have to go about clearing more space on the shelves: I think Rusty would have solved that problem for me very fast – had I let him near those bottles. I have no perfume-related new year resolutions (unless writing more about it counts as a resolution?). At least when it comes to smelling new things. I’m more in the mood to actually cull my decant stash to something usable, maneuverable and something I have a control of. I realized recently that I need to use my decants more often because perfumes in those might go off even sooner than their brethren in bottles.